It’s a little known fact that I don’t know this area very well. I explore now and then, and I look at maps, but for the most part the adventures that Erin and Adrian have found themselves on have been the result of me getting lost driving around. I found Stinson Beach one day when I drove the kids across the Golden Gate Bridge and just decided to take a left; I found Mount Tamalpais when I meant to go to Muir Woods and the parking lot there was full so I just kept driving. We ended up going to Point Lobos because I just felt like driving south one day and I thought Highway 1 would be nice. 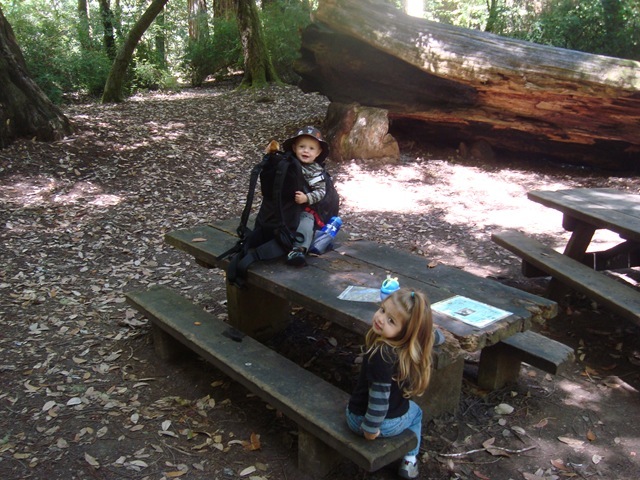 I took the kids to Big Basin on Monday, however, deliberately, knowing much more about it than I had known about any other park or open space we’d ventured to. So it figures that after an hour and a half of driving, a $10 parking fee and a $5 trail map later, we walked for about 45 minutes, had lunch, and then went home. It was kind of the opposite of the nearly completely free day we spent at Point Lobos. 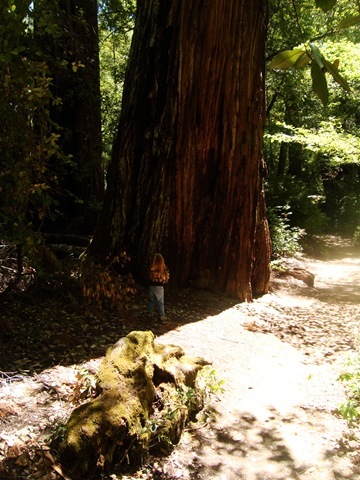 It’s a real shame too, because Big Basin is one of those real parks: the kind that people go camping in; the kind with a ranger station; the kind with a museum; the kind with a store. I think you can go to Big Basin owning no outdoorsy things whatsoever and get completely outfitted with gear and food and firewood and clothing. Provided you’ve got the cash, of course. It’s a bit touristy, which is a weird thing for me to say about a park, since the whole point is to attract visitors and I’ve been to a bunch of them, as basically a tourist. But it was just more 50’s Life Magazine than I was expecting. Maybe that’s why we only stayed a short while. Anyway, Big Basin sits in the mountains just north of Santa Cruz. You get there from the Peninsula by going through Saratoga, then up over Skyline and then on the 236, a winding, one-lane road (with two-way traffic) snaking around the hills. It’s a little shocking to turn a corner and suddenly have to swerve to the right to avoid the minivan coming at you. It was very warm when we arrived. Being up in the mountains doesn’t mean cold, not in California (and not in what passes for mountains along the coast here). So we were able to leave the sweatshirts in the car. 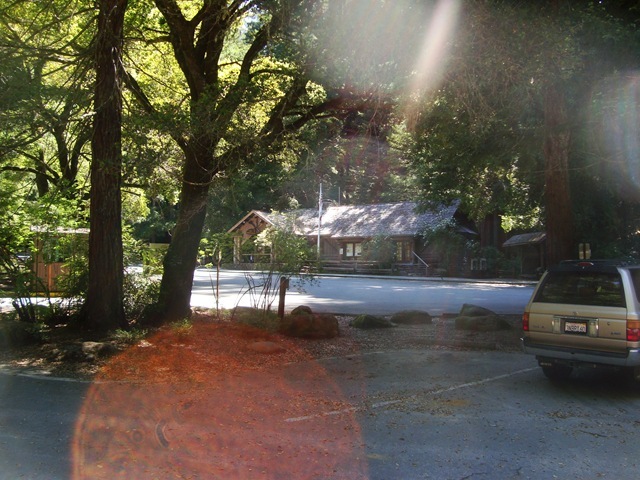 The area surrounding the ranger station is very built up, in a park way: the bridges are sturdy-looking, the trails are wide and manicured. The trees are huge. 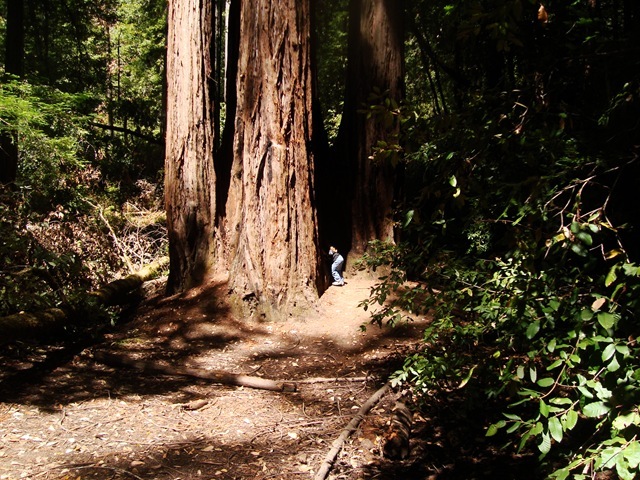 Big Basin is a redwoods park. Adrian was noncommital about the experience. Erin thought about making herself at home, but I think an Ewok kicked her out. 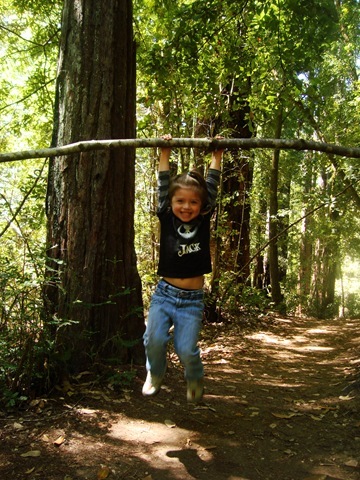 When you go hiking with Backpacking Dad he doesn’t just point out the rocks and the trees and the streams and the squirrels…he bends the forest to his will and makes a playground of nature for his daughter! One good thing about the backpack is that it affords the shorter children a ready-made seat from which to enjoy their lunch, provided dad remains close by to guard against toppling. As I said, we left soon after. 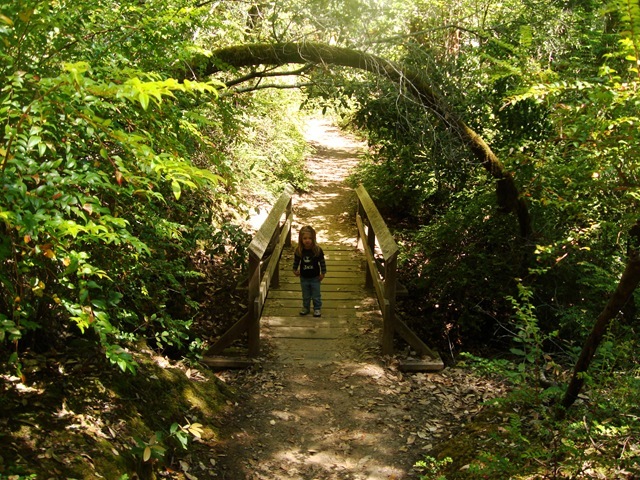 There are miles and miles and miles of trails to be explored there, many of which probably aren’t as neatly maintained as those closest to the ranger station. 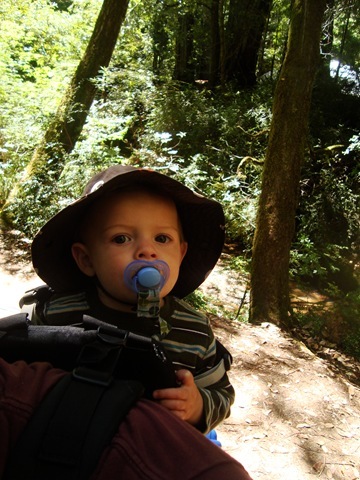 One called “Skyline to the Sea Trail” looks worth trying some day early in the morning so that we can make a day of it, but there was no way I was going to start it at noon, not with kids needing naps in the near future. I know this reads pretty ambivalently. 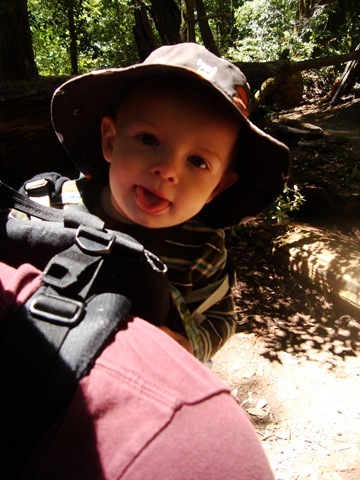 I was really excited to go to Big Basin and then as the hiking went on for a bit I was less excited. I’m not sure Big Basin is really to blame for that, though, since it’s not like we saw a ton of it. But I do blame it for the mosquitoes that showed up during lunch and then chased us all the way back to the parking lot. The kids had fun, though. Sorta. We have a park similar to that one close to where we live. Sometimes I go there. It makes me wonder why it's not crowded with people because OMG, it's so beautiful and simple. Wow! Those huge trees are really impressive. Sometimes the best adventures are the unexpected ones. 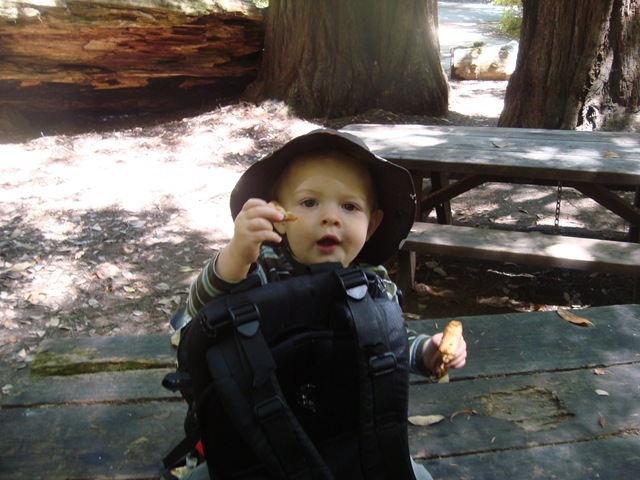 Husband and I camped in Big Basin (before we had the child). It was a bit later in the summer. Like you, we drove down there on a whim. Husband bought a ring in the shop. And we were almost eaten alive by mosquitoes. It was really unexpected. I'd been spoiled by non-mosquito parks. Previous Previous post: Wordless Wednesday: Erin and Adrian Go to Mount Tamalpais and Then Hike Down to Stinson Beach and Then Back Up and Erin Doesn’t Stop Talking For the Entire 7.3 Mile Trip Even on the Ascent After Lunch That Involves Climbing Switchbacks in the Woods For Basically an Hour and a Half Until Things Level Out a Little and the Morning Descent Down an Infinite Staircase with a Baby on My Back Seems Like a Past Life.